Recently we had privilegeâ€‹ to watch The Convicted Directed by Josh Mitchel. We had a short conversation with him about the gripping short film that tells the power struggle in life of a Gangster. Film has authentic feel of Ganster Film that is very rare to find even in big hollywood films. Film has some interesting performance ably directed by Josh. 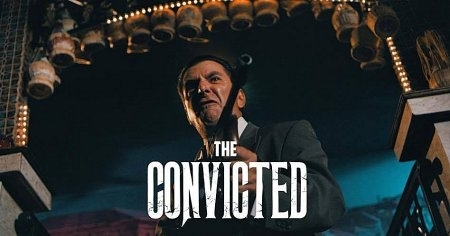 The Convicted. What does the story is all about? This is the story of a mafia boss and his fall from grace and loss of power. Tell us a bit more about main protagonist. What is his brief history. Any about casting of your actors for respective roles? The film centers on the powerful and dangerous Don Figaro who is played handsomely by the talented character actor Tommy Otis. How was your experiences about working with Cast Of the Film? I had the pleasure of working with a dedicated and collaborative cast who brought a diversity of stellar ideas and elements to the production. To create the required Gangster feel for the film. What were the things that you had to work on most? We had to create an authentic set and atmosphere and, fortunately, we were able to shoot at the historic Italian restaurant Micelli's so that definitely helped with setting the stage. We also had realistic guns and fancy suits. Being an actor yourself and now holding behind scene job. What were your personal experiences? Did you really enjoy being the Captain Of Ship? Directing a short film definitely has an aim that it gets viewership. What are your plans that it receives maximum audience? Last month we had the honor to be featured in the HollyShorts Film Festival at the historic Chinese Theater so that has helped with our branding and exposure in terms of attracting fans and viewers. The first installment is currently available for purchase on Vimeo Demand and we just finished shooting the next episode this week. For the last 25 or so years, Don Figaro (Tommy Otis) has led his little Mafia family with a bit of an iron grip, but also to everybody's satisfaction (everybody in the family that is).